Recondensing superconducting magnet systems use a 4.2K cryocooler to recondense liquid helium boiloff during static (persistent mode) operation. Depending upon the particular system design and the customer’s planned use schedule, the 4.2K cryocooler can completely stop liquid helium boiloff and result in a zero loss system. 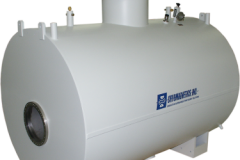 Recondensing systems are usually designed with a small amount of stored liquid helium. This results in a more compact design as compared to traditional superconducting magnet systems. 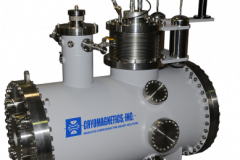 In all recondensing superconducting magnet systems, Cryomagnetics proprietary high temperature superconductor current leads are installed to minimize liquid helium usage. 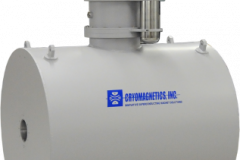 Cryomagnetics’ high temperature current leads are proven performers and have been used in many superconducting magnet systems over the years. Always designed with safety in mind, all recondensing systems are designed to ASME code and manufactured in Cryomagnetics’ facility under strict quality procedures. 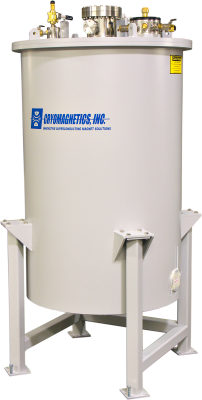 All recondensing systems are equipped with Cryomagnetics exclusive HRC-110 Helium Reliquefier Control System. 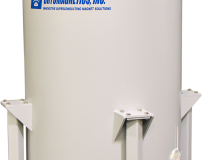 The HRC-110 is designed to control liquefying rate by constantly monitoring pressure in the superconducting magnet system’s helium chamber. Positive pressure will always be present within the helium chamber, thereby reducing the risk of ice formation. 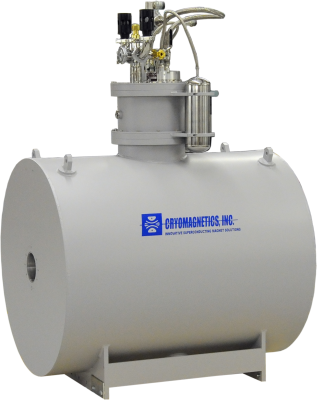 Features a digital display and easy integration in existing superconducting magnet systems. As with traditional liquid helium based superconducting magnet systems, recondensing systems are available with a variety of thermal radiation shielding options. Intermediate thermal radiation shielding using liquid nitrogen is available, or designs with multiple thermal radiation shields without the use of liquid nitrogen are available. Experiments that require elevated temperatures in the room temperature bore can be accommodated as well as other special conditions. Another very important factor to consider when deciding between a liquid cryogen free or a liquid helium based system is how the design addresses power outages and superconducting magnet quenches. 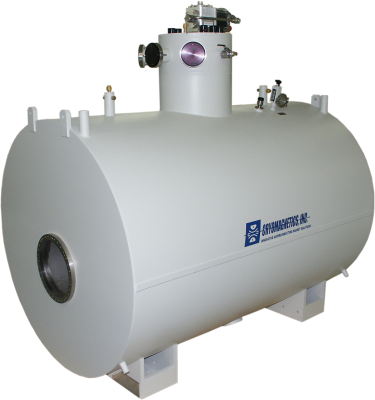 In the event of a power outage or cryocooler failure in a recondensing system, the liquid helium buffer will allow enough time for a safe discharge of the superconducting magnet without quench. In a liquid cryogen free only system, the time between loss of cooling power and temperature rise above 4.2K is a matter of minutes, not allowing enough time for the safe discharge of the superconducting magnet. The recondensing system can be viewed as having the best of both liquid cryogen free and liquid helium based systems—liquid helium costs are minimized, systems can be made smaller, and they have the ability to tolerant power faults without superconducting magnet quenches. Custom designed solenoid configuration with a 14 Tesla central field (4.2K) and high resistance, persistent mode switch installed. One (1) ruthenium oxide temperature installed to monitor temperature during operation. 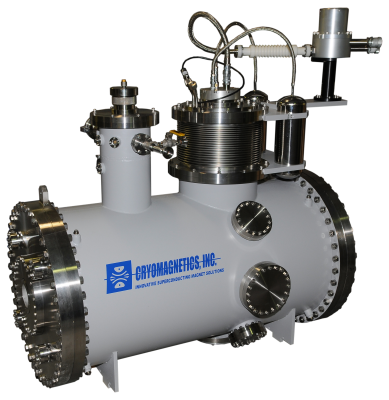 4.2K pulse-tube or Gifford-McMahon cryocooler to reduce or stop liquid helium boil off. Room temperature bore diameter: 127mm (5.00 inches) I.D. Redundant liquid helium level sensors installed. Safety sealed quench relief system. Vacuum space safety drop out plate. 15 foot long instrumentation cabling. One (1) ruthenium oxide temperature installed on the thermal radiation shield to monitor temperature during operation. 1.0W @ 4.2K pulse-tube or Gifford-McMahon cryocooler. One (1) ruthenium oxide temperature installed on the 1st stage of the cold head to monitor temperature during operation. One (1) ruthenium oxide temperature sensor installed on the 2nd stage of the cold head to monitor temperature during operation. The compressor service interval is 15,000 hours. This is a simple adsorber replacement. Set up as a single channel instrument to monitor liquid helium levels. 240 x 400 TFT LCD display. Manual update or continuous operation. Sensor calibration via front panel menu. Can drive sensors up to 200cm active. High and low setpoint control output. Used to monitor cryocooler, shield, and superconducting magnet temperatures. Set up as a dual channel instrument (Option 3 installed) to simultaneously monitor two temperature sensors. Prewired to house all instrumentation quoted.